Charlotte Applegate, Debbie Boller, Ginny Gaines, Jeanne Johnson and Dee Coulter decorate the Tree of Memories at the Benewah County Courthouse. Residents can memorialize lost loved ones by placing named ribbons on the tree. Registration forms can be found at the Auditor's Office or Four Seasons Realty. 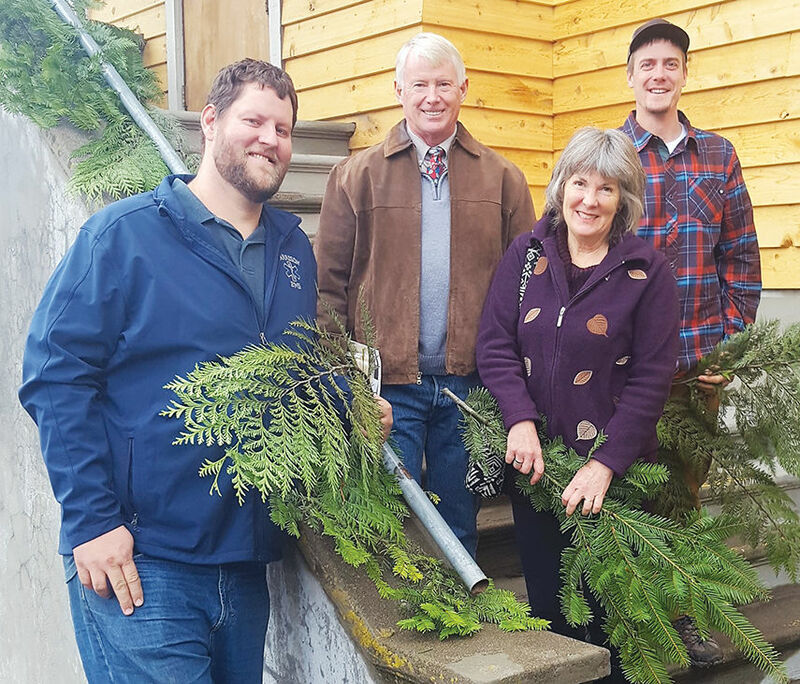 There will be a memorial ceremony at the courthouse Monday, Dec. 14 at 5:15 p.m.
Colton Galle with his set-up crew, Kevin and Julie Kincheloe and Tim Robinson putting finishing touches on the outdoor decorations for the Harrison Winterfest on Dec. 8 from 3 p.m. to 7:30 p.m. Not Pictured: Hannah Whipple and Shawn Unger. Members of the St. Maries High School's Jack Bots robotics team drove last year's creation down Main Ave. during the Christmas in St. Maries lighted parade Dec. 1. The team used the flipping apparatus on the top of the machine to toss candy and treats to waiting children. Summer Williams leads her lighted horse down Main Avenue during the lighted parade. A procession of Whos on horseback graced the lighted parade at Christmas in St. Maries Dec. 1. Kytalin Craner, daughter of Andy and Kelsey Craner, performed several pieces on the violin for the Church of Latter Day Saints nativity festival, Saturday evening. She picked up the violin just 18 months ago and plays piano as well. A couple in attendance at the Church of Latter Day Saints Community Nativity Festival views 1 of 123 different nativity scenes on display. Mayor Tom Carver (back) and Emmah Spooner perform an instrumental duet of Silent Night at the Church of Latter Day Saints nativity festival. Nancy Fitzgerald, president of the local Humane Society views a nativity scene on loan to the Church of Latter Day Saints nativity festival. Event organizers Renee Rouse (left) and Shirleen Jiles volunteered as some of the "many hands" it took to string over 4,000 lights and inventory 123 nativity scenes for the Church of Latter Day saints nativity festival. St. Maries residents are invited to the Nazarene Church's Community Christmas dinner Dec. 10. There is no cost to attend the dinner, which will include turkey, mashed potatoes and more prepared by church volunteers. Seen here are organizers (from left). Bev Burch, Jamie Spooner, Becky Luther, Michelle McDaniel and Pam Schiermeister. Not pictured is Sue McDonnell. Claire and Ashlyn McMannis walk with Asher and Brooklyn Scheffelmaier during the pet and costume parade during Christmas in St. Maries Dec. 1. Jessica Webb walks her cat, Fuzzy Wuzzy, in the pet and costume parade during Christmas in St. Maries. Brady Payne, dressed as an elf, walks with his dog Lilly, who is dressed as Santa Claus. Jonas Berkshire walks with his bunny Sherhops at the Pet and Constume Parade Dec. 1. Joseph, Hyrum, Alven and Aubrey Lyle lift a dragon during the pet and costume parade at Christmas in St. Maries Dec. 1. The annual Presbyterian Christmas Bazaar is Friday, Dec. 7 at the Community Presbyterian Church. A variety of local crafts and treats will be available for sale, auction and raffle. Seen here displaying some of the items on offer are (fron left) Pam Anderson, Kay Cowin, Jane Thornes and Kathy Martin. Phlebotomist Tami Bell sits comfortably in the new patient lab-bench purchased for the Benewah Community Hospital by BetterCARE. Santa greets children at St. Maries Floral and Gift and will attend the Elks brunch Dec. 9, which features pancakes with Santa. Kenny Moore offered rides to residents in a horse-drawn cart during Christmas in St. Maries. Children and their parents line up to meet Santa at the Shadowy Rivers Mall Dec. 1. Roger Darnold flips burgers for people on the street. Groups of people lined up to purchase refreshments, food and gifts from vendors at Christmas in St. Maries. Phil Epler with the St. Maries Senior Center presents the Elks Lodge with a $1,000 donation for the Elks Christmas Baskets. The Senior Center donates annually to the baskets. Pictured are (from left) Past Exalted Ruler Carl Witten, Past Exalted Ruler Jim Scourey, Exalted Ruler Jimmy Broyles, Past Exalted Ruler Alan Moore, Phil Epler and Loyal Knight Leo Potter. Dale Hawkins (left), Hari Heath, Jeanette Finicum and Mark Herr organized Ms. Finicum's visit to St. Maries through the Center for Self Governance. Ms. Finicum is the widow of Levoy Finicum who was killed during the 2016 Malheur National Wildlife Refuge occupation. Dan Stapleton attended the annual Lumberjack Hall of Fame Banquet Nov. 30. Dennis Humphrey and Hayden Humphrey look over auction items at the banquet. Brianne and Lane Watkins chat during the banquet. Duffer Michael attended the Lumberjack Hall of Fame Banquet Nov. 30. It was a packed house for the Lumberjack Hall of Fame banquet Friday at the Elks Lodge. The annual event serves as the major fundraiser for the Lumberjack Booster Club. Final figures and costs were not tabulated at press time, but the auction brought in more than $20,000. Dennis Humphrey congratulates Dan Felton, the 2018 inductee into the Lumberjack Hall of Fame. The St. Maries Fire Protection District took second place at the lighted parade.